Features: Acrylic Hard Plastic Name Badge Holders. Fit horizontal credit card size of name cards. The high quality and low cost rigid name badge holders are great for horizontal rigid plastic name badges. You can access your name badges from the side of holders easily. The sturdy plastic holders can give you a great protection of your name cards. 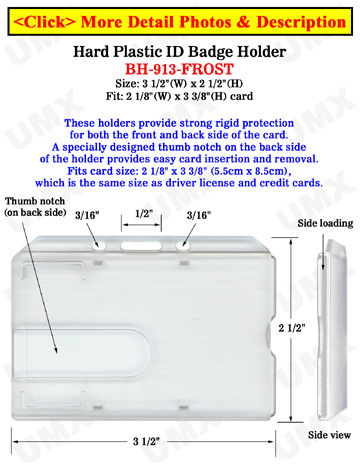 It is great for general purpose or horizontal security access name cards. In Stock Colors: Frosted Clear color.